After living as a renter for most of my adult life, I purchased my first home in March of this year with my husband. We made the choice to stay close to the urban core of Denver and bought a condo. It’s a new reality for us, as we learn how to deal with the homeowners’ association board, management, and monthly fees. The process has given me cause to reflect on the concept of investing in the communities in which we live. In order to live in my condominium building, we agreed to pay monthly fees to ensure that the grounds are kept up and the common pool is regularly cleaned. By building up a reserve, we can also make some needed upgrades–like replacing the hot water heater that is over twenty years old or replacing the landscape with plants that would require less water (and thereby lower our water bill in the long-term). I can clearly see the effects of investing in these things alongside my neighbors. The principle is similar when we pay taxes—we hope to see some direct benefit from the investment that we make in our city, state, and country. The benefit we all derive from paying taxes can often feel quite removed; it isn’t the same as seeing the changes occur right outside your front door. However, I see the benefit when I drive down some streets in Capitol Hill and they’re instituting repaving projects with our tax dollars. I also see the benefit of our tax dollars when I take the light-rail to the airport. At the federal level, I see the benefit of our investment when I know our neighbors are able to take advantage of important, life-saving programs like Medicaid and food stamps to get through rough patches or stabilize their families’ health and incomes. Taxes are an investment in our communities, and when we invest in our communities, we can improve health. 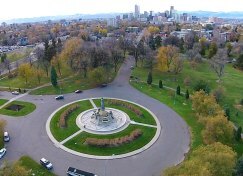 The Lincoln Park neighborhood in Denver that was highlighted in a recent Colorado Health Foundation report is a great example. Using taxpayer dollars from the Denver Housing Authority and partners, residents were able to start community gardens, which improves their access to nutritious food. Another example is education—data shows that education and health are closely linked, so investing in education improves health. Parks for recreation, public health programs that eradicate disease, clean air to breathe—these are all things supported by tax dollars that help make us and our communities healthier. That being said, there is a need for accountability in government spending so that we get the maximum benefit from the precious investment we ask each community member to make. For Colorado to thrive, everyone needs to pay their fair share, and we need to see the results of our investment paying dividends in the form of healthier communities. If we start with a shared vision for Colorado’s future, we can see what type of an investment we’ll need to make in order to reach that vision. Paying taxes, HOA fees, or other mandatory charges can feel unreasonable or unjust, because we all work hard for each dollar we earn. However, the return on our investment is all around us in the form of shared resources, infrastructure, and—in my case—consistent access to hot showers that our building’s old water heater couldn’t provide! So, I intend to keep investing and keep appreciating the benefits I receive from that investment. And, I’ll be sure to speak up to make sure my money is being put to good use.